Impactful Mosaic of a Multitude of Considerations. This book is AMAZING, life-changing even! So relatable and thought-provoking. Such great storytelling, paving the way to vulnerability as I have never experienced before. Such a beautiful gamut of input and perspective! I am not alone; you are not alone; we are not alone! 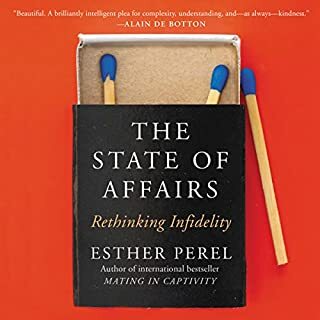 Esther Perel, the author, is also the one reading and her examples, lessons, and thoughts come alive through her voice. I am so, thoroughly, enthralled with this comprehensive work that she has written.